People always ask me what my favorite snack is. Without question, it's Doritos. Original Nacho Cheese Doritos. All other flavors are imposters. But because I'm Nik Snacks, I can't JUST have plain ol' Doritos. I have to have tricked out, fresh-to-death, super clean Doritos. Also known as Walking Tacos. Basically crunch up the chips, add your favorite taco toppings and eat. Who doesn't like portable food? Place chili in a microwaveable bowl. Mix the taco seasoning and heat in the microwave on HIGH for 90 seconds, at 30 second intervals, stirring between each one. With the bags unopened, gently crush the corn chips. Snip the corners off the bags using scissors and slit open the bags along the side edge. Spoon equal amounts of the bean mixture, lettuce, cheddar cheese, salsa and sour cream into the bags on top of the crushed chips. Serve in the bag and eat using a fork or spoon. Such a cool idea! I love it and very creative! Doritos are a total guilty pleasure food for me. I can't ever have them in the house because I will eat the whole bag. 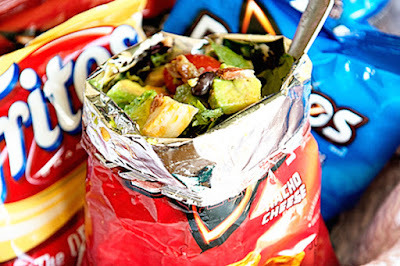 We love walking tacos, but I've never made them with Doritos! I absolutely LOVE Walking Tacos - one of my favorite ball park foods growing up. My kids like them with Doritos, too..but I'm partial to using Fritos for mine. Either, way - bring it on, I'm craving some now! I've been wanting to make these walking tacos for a while. They look so easy, can't wait to try, they look amazing! So fun! These would be great for a party too. Like a make your own walking taco bar or something.